I’m settling down to the task of recreating the paperback version of The Steerswoman, to match the size of the other three volumes. As you may recall, when I published The Steerswoman in paperback through CreateSpace, I selected the 8-inch by 5.25 inch size. I actually put a lot of thought into this choice, taking into account the page-count, font-size, and finally, how the book would actually feel in the reader’s hand. 8×5.25 seemed like it would be just right: a good-sized, substantial book, not too big, but not too small. And when the proof copies arrived, I was pleased with the result, certain I’d made the right choice. Even though the smaller size meant more pages, and the cost of printing was based entirely on the number of pages — even though it raised the print costs and cut into my profit — I thought the result was worth it. The Steerswoman comes to about 97,000 words. The Outskirter’s Secret? 138,000. At 138,000 words, the page count went up to around 500 pages, and the production cost was so high that not only would my profits drop to zero, they’d actually go negative. That’s right: I’d have to pay Amazon extra every time someone purchased a copy. Alternatively, I could raise the price of the book, but charging over $30 for a trade paperback would severely decrease my sales. To, that is, approximately nada. Obvious solution: bigger format. At 9 by 6, the problem goes away completely! Bigger pages = more words per page = fewer pages = lower costs. Voila. But I knew I’d be returning to the issue later, and would re-do the first book to match the others. And I’ve now decided that February is the time to do it! Slight problem: CreateSpace no longer exists. CreateSpace has been owned and run by Amazon for a while now, but during that time the Kindle service started adding an option to create paperbacks as well as ebooks. They actually streamlined the process so that you could create your paperback from the ebook pretty easily. But I had compared the two services, and chosen to go with CreateSpace for very good reasons, including a higher royalty, better distribution to non-Amazon markets, and faster payment. But a few months ago, Amazon warned us that they were about to axe CreateSpace, and all our books were going to be shifted over to Kindle Paperback. And in general, that’s not a bad thing. They’ve actually adopted a lot of the CreateSpace advantages, and it’s nice to have all my sales on one report. But they really want you to create your paperback from your ebook, and they tossed out the lovely CreateSpace paperback-creation interface. And now I have to do more work by hand. Fortunately, I can; I’ve got the chops. But it is more fuss-intensive, because of the reformatting to the larger size and all. But I also worry — is the paperback created by the Kindle paperback process going to look different from the CreateSpace books? In subtle ways, perhaps, like quality of paper, thickness of cover-stock, color saturation on the covers? There’s just no way to know until I do it. Now, you might ask: Since Kindle wants you to make your paperback from your ebook, and you alread do have an ebook of The Steerswoman, why not just let Kindle do the work? First, the paperback covers are different from the ebook covers. And for good reason: Something that looks eye-catching as an small image on a glowing screen might look like crap when it’s printed out in physical form. I specifically made the ebook covers uncrowded and clean-looking. But that openness doesn’t work for a paperback; it just looks empty. So I added the black bar background behind the title, to give it more presence, and to differentiate it more clearly from the map. But creating paperbacks automatically from the ebooks would put the ebook cover on the paperback. Second reason: The paperbacks have all the typo corrections! A lot of you have been alerting me to the typos (and thank you for that), and all those corrections went into the paperback versions. And after this, I’m going to be recreating the inside of the ebooks using the text of the (hopefully) typo-free paperback versions. But that’s a whole other task. Right now, let’s get that large-format edition of The Steerswoman going. Which, by the way, will involve recreating the cover, which is actually more difficult than resizing the text pages. In other news: That non-flu cold thing knocked me back pretty hard. I’ve been over it for a while now, but it pretty much ate up January for me, including my plan to have another internet fast. I couldn’t just shift it on to Feebruary, because I had plans that involved a lot of internet accessing. I felt that the internet fast did me some good, and I really do want to solidify that. So… March? Maybe? 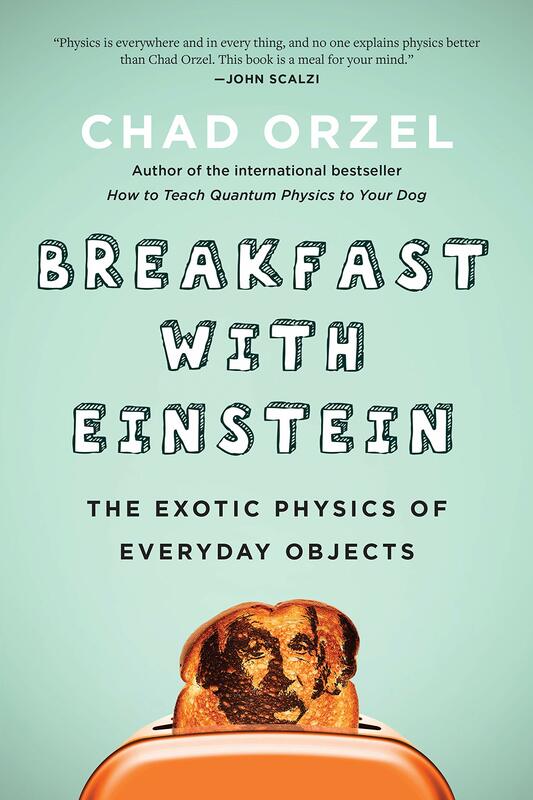 That’s right: Chad Orzel‘s latest, Breakfast with Einstein was featured in the New York Times Book Review, in a shortlist of new physics books. I love it when good things happen to people I like. Chad also writes science articles for the online edition of Forbes magazine. If you love science, and want layman-friendly news about what’s up lately in quantum research (like what’s all this fuss about a crisis in physics? and do we really need another collider? ), you should add him to your blog feed. He also has his own website, of course, with all the info you might need or want, including a personal blog. You know, life of a scientist/science writer: family, non-science musings, dog pictures – the whole shebang. If you think that real scientists are all like Sheldon and the guys on The Big Bang theory — well, Chad’s blog can help you get over that. This entry was posted on Thursday, February 14th, 2019 at 2:10 am. You can follow any responses to this entry through the RSS 2.0 feed. Both comments and pings are currently closed. Yay! Fingers crossed it’s going to be a painless process & good result. Also hoping that the process is quick and painless! When I read about your production of physical paperbacks originally, I took a look at CreateSpace to find out about distribution, since I wanted very much to order the books from the SF bookstore in Toronto that had provided me over several years with multiple pairs of the first two books to give to all my friends. It wasn’t clear if the distribution mentioned extended to Canada. Somewhat later, when I managed to get in to the store, I mentioned that you were making the books available again, and received the response “Oh, yes, people ask for those”. At this point I discovered that Amazon was discontinuing CreateSpace, and wondered if they were allowing any distribution at all outside full price purchase on their website, which certainly wouldn’t work for a bookstore. Obviously, I should wait until you have finished creating your matched set, but I hope you can mention where to find the information needed by a bookstore when it is ready. I’d like to complete my collection of all formats as soon as possible;-) And, of course, read again in anticipation of adding book 5 when you have it available. Each time is better than the last. Fast recovery from the cold (just because it’s common doesn’t make it minor)! Thanks for asking. Here’s the scoop. Because my books are enrolled in Amazon’s “Expanded Distribution” feature, they should be available for retailers to order through their their usual suppliers. In the US, this is often a distributor called Ingram; I’m not sure if Canadian bookstores also use Ingram, or some other company. Now, this is how it works in theory! I actually have not heard from anyone on the “inside” of bookstore ordering whether this is as seamless a process as Amazon promises. But I do know that it does happen! My sales reports include the category “Distribution Sales,” without specifying the specific distributors by name. So,I called Bakka-Phoenix today and ordered the four books. The process wasn’t exactly seamless, but was possible to complete while on the phone. First, the person helping me said they were out of print. I told him you had republished them through Amazon and had been told they would be available through bookstores’ regular distribution channels. He couldn’t find them through Canadian distributors, so he rummaged around and found a US source in Texas. He said they only had the first three books, but when I gave the title of the fourth said oh, they had that too, it had only come out in February. Being helpful and straightforward, he explained that Amazon gave what he called a short discount, so that they couldn’t even come close to matching the prices on Amazon’s website. The best price they could offer, in fact, would be about 50% more. I asked him to order them anyway, and mentioned that the fifth book was forthcoming, I hoped within the year. He said they would definitely be interested in carrying that, and I plan to keep an eye out and order it from them to remind them when the time comes. This store is a centre for hard-core SF fans, and is located in the University of Toronto district where it can, as they said of Socrates, corrupt the youth! Obviously,some of the extra scrounging around was due to being outside of the US. However it sounds as if it wouldn’t hurt for those of us who follow you and also want to support local bookshops to inquire about the books while browsing in them. There are a lot of books for the buyers to stay on top of, and I’m sure they pay attention to customer interest to help with their decisions.